This dress belonged to the famous Italian actress Eleonora Duse (1858-1924), noted for her association with the poet and playwright Gabriele d'Annunzio. Duse was a great friend of the designer Mariano Fortuny (1871-1949) and was known for the fact that she used very little make-up in an age where acting demanded dramatic costumes and disguise. Duse was the first woman to appear on the cover of Time magazine in July 1923. The dress was purchased from Vitaldi Babani, a designer-importer who launched his business in 1895. His shop 'Babani' was situated at 98 Boulevard Haussman. 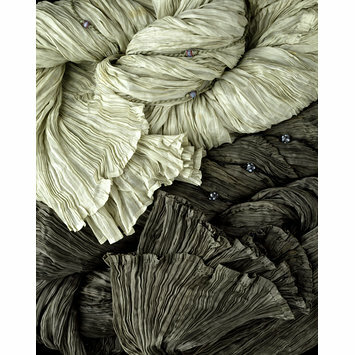 Along with the designer Paul Poiret, Babani was licensed to sell Fortuny designs in Paris. In addition to retailing Fortuny designs, Babani sold Liberty textiles and produced fabrics and garments of his own design that bore the influence of these designers. The multi-talented Fortuny was a painter, theatre designer, photographer, inventor and scientist. 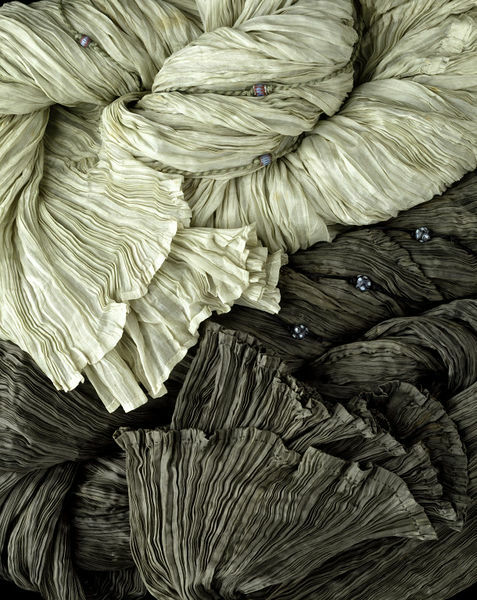 However, he is best known as a creator of extraordinary fabrics and clothes. His distinctive creations were worn by avant-garde beauties throughout the world from about 1910 to the 1930s. His most noted design, of which this is an example, was the 'Delphos' dress inspired by the draped costume on Greek statuary and registered in 1909. He achieved the column-like effect through his patented process of permanently pleating the silk so that it clung to the contours of the body. Dress of dark green pleated silk. It is laced at the shoulders with black silk cord and spherical black beads with white spots. It has blue satin ties under the bust to adjust the fit.